On February 23, 1836, the Battle of the Alamo began. Around 1718, the Spanish built a mission, San Antonio de Valero, in San Antonio. The mission, which consisted of a monastery and church surrounded by a high wall, later came to be known as “the Alamo,” after the Spanish word for the cottonwood trees that surrounded it. The people of Texas occasionally used the mission as a fort. In 1820, a Missouri banker, Moses Austin, obtained permission from Spanish officials to establish an American colony in Texas. Soon, more Americans received land grants from Mexico. Between 1821 and 1836, the number of settlers in the area grew to about 30,000 – and most were Americans. The Mexican government became concerned over the high number of Americans in its territory, and in 1830, Mexico halted American immigration. Relations between the settlers and the government quickly deteriorated. In 1834, General Antonio López de Santa Anna, a Mexican politician and soldier, overthrew the Mexican government and established himself as dictator. 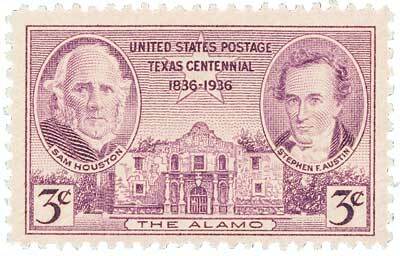 U.S. #776 – This Texas centennial stamp pictures the Alamo, Sam Houston, and Stephen F. Austin. After a few clashes between Texans and Mexican soldiers, Texas leaders organized a temporary government on November 3, 1835. Texas troops captured San Antonio on December 11, 1835. Enraged, Santa Anna sent a large army to San Antonio to put an end to the uprising. On February 23, 1836, about 5,000 of Santa Anna’s troops approached San Antonio. The Texans were caught by surprise. About 150 Texans took refuge in the Alamo, preparing for battle. 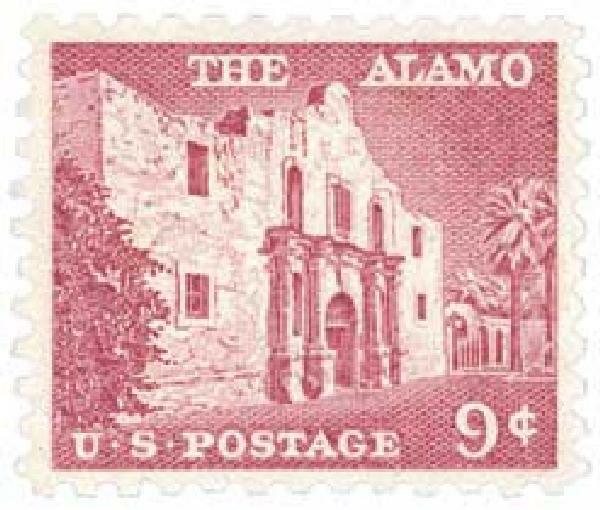 While Santa Anna laid siege to the fort, only a small number of reinforcements were able to reach the Alamo, raising the number of defenders to 187. The defense included several frontier heroes, including James Bowie and Davy Crockett. 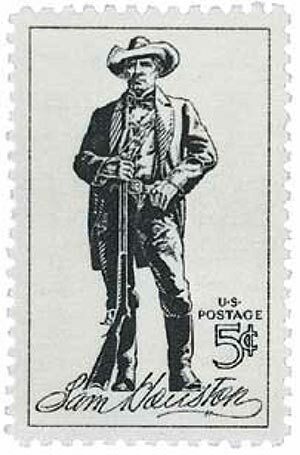 U.S. #1330 – Davy Crockett died at the Alamo, though historians debate how and when. 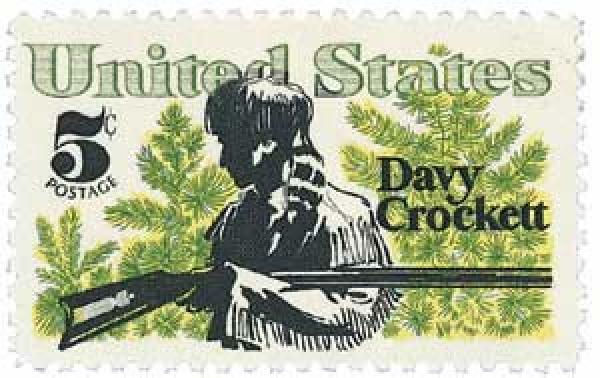 U.S. #3876 – John Wayne played Davy Crockett in the 1960 movie, The Alamo. The Texans bravely protected the fort. Eventually, they ran low on ammunition and were unable to return fire. Then on March 6, 1836, Santa Anna’s troops were able to scale the walls of the Alamo. The Texans fought using their rifles as clubs, though the only survivors were the wife of an officer, Mrs. Dickenson; her baby; her nurse; and a young black boy. U.S. #1242 – Houston led the Texans to victory in the subsequent Battle of San Jacinto. “Remember the Alamo” became the battle cry of the Texas independence struggle. The defense of the Alamo had bought the Texans valuable time to organize their remaining forces. On April 21, Sam Houston led a smaller Texan army against Santa Anna’s forces in a surprise attack at the Battle of San Jacinto. The Texans were able to capture Santa Anna himself, and forced him to sign a treaty giving Texas its independence. Texas remained an independent republic for ten years. Then on December 29, 1845, it was admitted to the Union as the 28th state. This entry was posted in February 2016, This Day in History. Bookmark the permalink. 8 Responses to "This Day in History… February 23, 1836"
One of my favorite ironies of history is that several years after the Alamo, General Santa Anna lived on Staten Island where he spent his time promoting chicle. I wonder what the folks on Staten Island thought about having the self proclaimed “Napoleon of the West” as a neighbor. Thank you for that wonderful moment in history. I have bee to San Antonio and visited the Alamo. It’s a great place in history where people cared about our country and didn’t try to destroy it. learned that he died from cancer, as I am a cancer survivor myself. articles in school. Learning a lot from all of there. 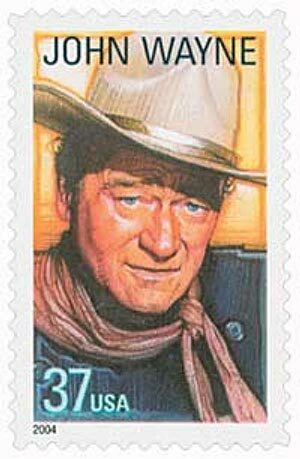 John Wayne’s movie, “The Alamo,” is about John Wayne as much as it is about the Alamo. It’s a pretty good film but it has a lot of “specifying,” about freedom and liberty, etc. mostly by John Wayne. The action sequences are well done, but the death of David Crockett (played by John Wayne) is pretty much made up. Americans today could learn a lot from John Wayne’s soliloquy on what is a “republic” and the true meaning of freedom. Actually there were several survivors of the battle. I’ll list them here: Bettie (Jim Bowie’s cook and a black slave along with male slave named Charlie) they hid in the kitchen during the battle. Juana Navarro Perez Alsbury ans her son Alejo Perez Jr, Susanna Dickinson and daughter Angelina Dickson, Ana Salazar Esparzaandher daughter Maria de jesaus Castro, son’s Enrique Francisci, and Manuel Esparza, Petra Gonzales, Conception Charli Gortari Losoya and son Juan Losoya, Juana Francisca Losoya Melton(daughter of Concepcion Charli Gortari Losoya,), Gertrudis Navarro, Sarah a mullato slave (possibly the only woman killed in the battle), Victoriana de Salinas and her three small daugghters, and Trinidad Saucedo. These woman Survivors, along with their children, appeared before Santa Anana after the battle. He interviewed them, gave each two silver dollars and a blanket, and released them. Having been born in Corpus Christi the history of the Alamo Battle. The last line should road: Having been born in Corpus Christi I know allittlr about the the history of the Alamo Battle.